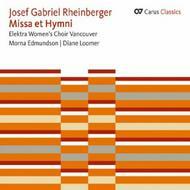 In addition to many compositions for mixed choir, the organist, conductor, composer and music teacher Josef Gabriel Rheinberger (1839-1901) wrote works for female-voice and male-voice ensembles. It is noticeable that he preferred to write secular part-songs, frequently in the style of the folksong or choral song, for male choir, while the majority of his sacred compositions were written for female-voice choir. This recording, which contains one of his three masses, is beautifully performed by the Elektra Women’s Choir Vancouver.